My online calculators have gotten a handful of hits, and not all by my friends. Things are going slow, and it'll take me a few lifetimes before I get the cheque from Google, but it's nice to get that validation in the Apache log - that somebody out there saw my page in a search result and thought maybe that was what they were looking for. Half surprising that all three are from South Africa - but maybe that's just one of the ways Google orders their search results? Information in a 7x7 board: log(3^49)/log(2) = 77.66 bits, too many to fit into a 64-bit register. Storing the value of each Ataxx position would require at least 2^77.66 trits (win, lose, or draw), which would require an insane amount of storage. No, naive brute force is crazy. But we could work "outside-in" - evaluating the fullest boards and storing their values in a table, then truncating a forward search whenever we hit one of these. How many of these full boards are there? If n = number of gaps, m = number of black pieces, then there are 49!/(n!*(49-n)!) ways to distribute the gaps, and (49-n)!/(m!*(49-n-m)!) ways to distribute the black pieces around the gaps, for a total of 49!/(n!*m!*(49-n-m)!) positions with a given n gaps and m black pieces. That's 100000000 trits (win, lose, or draw) compressing to 107495 bytes: a compression ratio of 184. All information should compress so well! I expect that with clever enumeration sequences, one can improve this compression ratio even more. Ternary Gray code anyone? 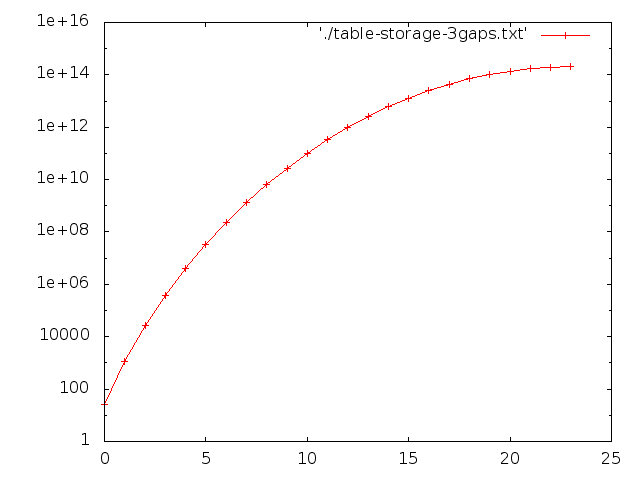 I've made a graph of compressed storage vs m, for n = 3. I didn't bother with m > 23 as the numbers are symmetrical about m = 23. It's clear that motivated wealthy individuals are able to store the values of all positions with only a few gaps, say, no more than 3. Now how long might it take to populate such a vast table? Bear in mind that this is just a naive implementation of what is likely to be a very bitbashing-friendly computation (Ataxx was designed to be easier for computers to compute than for humans!) Furthermore, populating this table is embarrassingly parallel - I haven't even used all four of my poor little laptop's CPU cores. By my estimation I could populate the 3 gaps, 23 black table in no more than 66 years. Probably a lot quicker if I spend just another hour teaching bruteforce.c a better representation of board positions, and using a popcount instruction that may or may not exist on my CPU. I'm quite optimistic about even a modest effort being able to muster the CPU power to populate this precious lookup table. There's a caveat here though: this relatively cheap seed table must hold values only for stalemate positions. Completely full boards are all finished, but but only some boards with gaps are stalemated. I should probably adjust the storage requirements about 30% upwards to allow the table entries to encode the fact that the value is unknown - to be filled in later during a forwards search.